HR 392 Bill latest news – HR 392 has been reintroduced in Congress by Lofgren and Buck as HR 1044. HR 1044 stands a better chance of passing in Congress as Lofgran is the chair and Buck, a ranking member of the House Judiciary Subcommittee on Immigration and Citizenship, putting them in a position to get the bill moving. The problem point may still be Sen. Charles Grassley (R-Iowa), who has blocked prior versions of the bill because of concerns about the H-1B program itself. HR 1044 has new clauses to fix the amount of Green Cards for countries other than Indian and China. This has been done to avoid any objections in congress based on the fear that all GCs will be taken solely by Indian and Chinese H1B workers. It also addresses American Hospital association and America Iranian council fears of giving GC only to two countries for decades to come. When HR-392 was a bill of its own, it had about 329 co-sponsors. It is supported by Amazon, Deloitte LLP, Equifax Inc., Hewlett Packard Enterprise, IBM Corp., Microsoft Corp., Salesforce.com and Texas Instruments among others to remove country based limits. If successful, it can change the life of Indian and Chinese skilled workers forever. A stop gap funding has been approved for DHS appropriations bill by president Trump till Dec 21, 2018. OH law reports that the President signed the DHS stop-gap funding bill as part of Continuing Resolutions which are attached to H.R. 6157 2nd Minibus FY-2019 Spending Bill, which does not include Immigration Bill to eliminate Employment-Based Per Country Limit. Earlier, the provisions of HR 392 and other such country based removal bills were added to DHS spending bill as a way to pass them along with avoiding the government shutdown. But, it has not happened yet. HR 392 is making news these days and is a hot topic in H1B skilled worker community as it is a crucial bill that holds the potential to change their future significantly with 327 sponsors. Chances of HR 392 Passing and becoming Bill? HR 392 is currently at introduction stage. There is a long way to go before it ever sees light of day. Given the current political scenario in Trump government and democrats priorities, the chances of this bill ever becoming a law are very LOW. 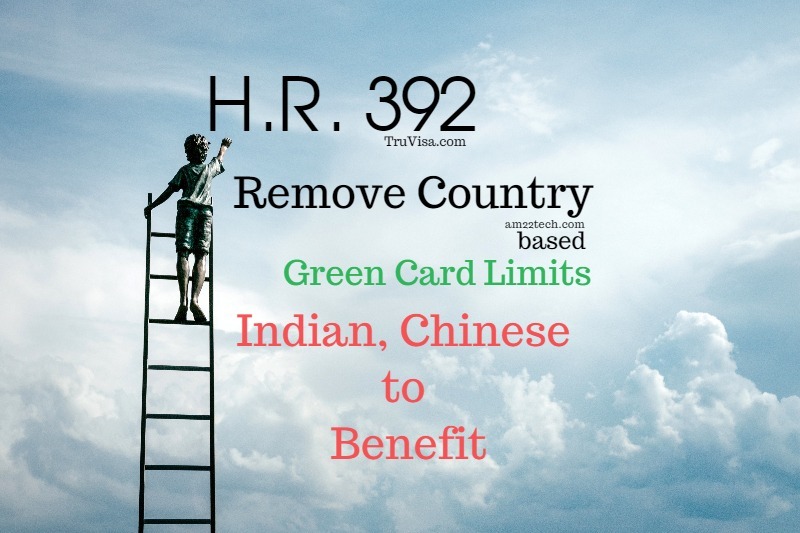 It’s good to have hopes but this bill is probably just an eye wash.
HR 392 aims to issue US green Cards on a first-come, first-serve basis instead of Country of Birth, thereby giving equal chance at obtaining US permanent residency to every one. Today, each country has a numerical limit of 7% (9,800 of the 140,000 annual green cards limit) green cards that can be issued. This bill intends to make this amendment in the Immigration and Nationality Act and completely get rid of country of birth based limits. 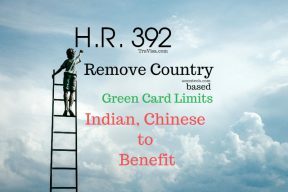 If passed, HR 392 has the potential of reducing the Green card backlogs exponentially for Indian and Chinese nationals working on temporary H1B visa in USA. For almost a decade, no other country except Indian and China will receive any Green card as their nationals, that are waiting in queue, will get benefited. H.R. 392 also has a clause to change limit on family based immigration from 7 to 15% effectively doubling up the chances of uniting the families. When you have an infection, you should treat it rather than trying to spread it to all. If Indians knows the pain of backlogs why they are trying to dump it to ROWs who are at NO fault for their self inflicted wounds? You guys should work with ROW instead of trying to drag them in same pain. The reason most ROWs’ community are opposing this bill is because it will impact them severely just to benefit ONLY Indians/chinese. If the bill would have proposed something like merit based, removing DV lottery to give it to high skilled or process the GC for those who are backlogged for, say 7-8 years, then we would have NO objection at all. But Sorry, HR 1044 is pure act of selfishness and ROW will never support it. This is not a high skill immigration bill it is Indian immigration bill. It gives monopoly to indian people and kills the diversity for which the US stands for. They create the problem so they are the problem not the immigration system. It will not increase their chance to get GC earlier but only mess up others’ chance. Is there any country which invites thousands of other country citizens and give away equal rights? 140,000 green cards are itself a burden to over crowded US at present. Now it has to be increased? Ban entire immigration for some time. Which country dictating US immigration laws or policies?. Traffic in single lane roads making life miserable at present with constructions going crazy destroying trees and life is horrible with high apt rents and groceries. If US cannot stop student/work visas, illegals, and free green cards, birth right citizenship and chain immigration, the current and future generations of US citizens have to find a country to go. Both parties have to think for the citizens not for party fund or other benefits. I agree with your post. Atleast they meaning the Business and Politicians should do it openly so that people can see how it impacts them. Why are we really importing foreign workers for? What is wrong in saying that cost of employment is the main reason for Business Enterprise, and it’s future growth and profit is what matters to them. I believe they should not be restricted on doing it and because of that I think it will eventually lead Citizens to think and correct themselves including the Politics behind it. This should automatically cut the offshoring of work or bringing temp workers from outside who are eventually going to stay and use the resources for free. Also I think only few people have extra ordinary talent that you could term earth shaking and the rest with reasonable skill and education are good at soaking it up. Paul Dirac, Oppenheimer is what we are looking for in this special category. Most H1Bs I consider are good at soaking up the knowledge as they have no other things to worry about. Nothing credible in terms of the so called talent and skill they are talking about. In otherwords, they are average like the rest of the Citizens, and therefore H1Bs go back home. American economy and its dollar rely on investment and investment rely on competitiveness and competitiveness rely on talent at affordable cost. I think this answers the question. I’ m not sure if Chuck Grassley gonna stop, why to even introduce the bill. When it has 329 cosponsors and 20 in Senate, it did not pass. How it will pass now? I think this is just to make money out of it for some people from backlogged folks. Do you agree? Yes, I agree. The chances of bill getting passed are low. Its probably just going to end the same was as it has been for the last couple of attempts. But, trying is still better than just keeping mum. By when we will know whether this bill will be moving or rejected? Is there any timeline? There is no official timeline to pass a bill. It all depends on voting. I will keep the article updated with the progress it makes. Personal suggestion: Do not rely on this bill’s chances of passing. The country limit removal has been in rejected many times and was first introduced in 2007-2008 i.e. 11 years ago. It has not been able to pass the congress every time it has been voted for. Can you share some insights on the 11 years progress/issues? Will try but will take time. I am stuck all day in answering people’s queries these days. I will try but cannot commit. If these H1 B workers are so great how come their country is so backward. Not only that the jobs they are going to work are soft skill and instructional based or a routine or cut & paste code. No one will turn out to be a Paul Dirac or Oppenheimer. Also their culture is biased one with classes and they are not considered equal before God like the way this country is. Go back to India before Kashmir falls off. Grow-up, talent shouldn’t be discriminated based on country. Obviously, US is well ahead because its openness to welcome dreamers and talents. You are probably eating fruits of work done by yester years’ immigrants which made US a strong economy. United we stand and divided we fall. US needs immigrants for better economy/productivity and immigrants need US for better future, they are mutually beneficiary. Your comment does not seem to have good taste and respect for others. We request to please discuss to-the-point without pointing fingers on anybody’s cultural background. Can you please explain more on this …. “HR 1044 has new clauses to fix the amount of Green Cards for countries other than Indian and China. This has been done to avoid any objections in congress based on the fear that all GCs will be taken solely by Indian and Chinese H1B workers. Temp workers do your job and go home. Can you invite a guest at home and make him permanent. Let us talk after that. do you give your guest an option to stay in your house ? H1B does that…it has immigration intent where you can file Immigrant petition and thereby become a permanent resident followed by citizen. why do you poke your nose without knowing these facts…..I understand being illiterate is not someone’s choice always…..but that also does not mean one would RAMBLE without a brain….naah…..no sense at all ! !….also Kashmir is an Integral part of India and the army takes very good care of it….So dont worry…..and who told you we are living here because India is backward…..there are many Americans living overseas….offcourse America is a GREAT nation…in fact the BEST of all….isn’t it ?? ?…..That’s why I am asking you go back to school and get some good grades with knowledge before spitting your hatred all around. You are a fellow American with sound knowledge. Look around and pay attention. You are there because someone created that opportunity for you and all you have to do is pride yourself. You should stay back home and kill Beef Eaters like your Kin and Friends are doing. That is a good job for your merit I suppose. Also you can popularize theories and conspiracy ones of course to falsify old sunken monuments of Dwarka city as old ancient culture and work hard trying to make your Devic Language as the oldest around. I got you a job. You go and work on it. It is cheap labor at best used by Corporations for greed and profit manipulated by a number of consulting agencies. I could go on but it does not help because at the end it does not help the country. I have seen once the H1 Bs proceed to citizenship they bring their parents to get social benefits. Now they send their children to good schools for free. Reciprocally no other country does it that way. i believe that Indians have corrupted the system and corporate enterprise is misusing it. I do not see it any differently than my landscaper hiring only Mexican immigrants for many different reason. Now I see he owns a big Farm and enjoying the dividends. Now local Americans feel the pinch and you can see them working part-time to make end meets and using the facilities of Hospitals and other Social Services. Ultimately, it impacts the common person here who works hard, sends their children to work in Restaurants, send them to War, fix the roads or move them towards depression for limited opportunities. The people from India are bad and borderline evil who know how to play the PR game. H1Bs don’t send kids to schools for free. The average age of Americans is increasing. US needs youngsters. US needs young people to contribute to SS…to support the older generation. Countries like India are spending money to educate its kids….and once they grow up, they start paying tax to US. At least they are standing in line for so many years unlike those who forced their way in. cheap labor or not, you as a consumer are reaping the befits too. Stop buying from companies that hire H1bs. Everyone here at some point came in as an immigrant to stop crying about it. I’m sure your ancestors came in the same way, instead of spewing nonsense and hatred without understanding the facts I suggest you full your head out of your a$$.